Construction: Included a well and water pump located on the porch, a large fireplace built with granite from Stone Mountain, Georgia, and tongue and groove pine paneling for many interior walls. The 40 acres of land where this house was built cost the first owner, Mrs. Clara B. Cassidy, just $10.00 per acre in 1933. 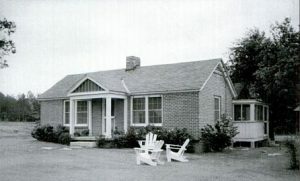 The home was constructed six years later in 1939 and was used as a hunting lodge and summer home. The home was sold in 1944 and subsequently sold 11 more times until 1979 when it was purchased by Ken and Brenda Lamb who are the present owners. The Fountainebleu neighborhood, which was built around the home, was heavily damaged by the Dunwoody tornado in April, 1998. The house did not escape severe damage and was condemned by DeKalb County. The Lambs restored this historic home to its original condition. The Dunwoody United Methodist Church began in 1899 as an inter-denominational Sunday School whose members met at the Dunwoody schoolhouse for the first four years. At that time, the Dunwoody School was where the current Dunwoody Library now exists. As the congregation grew, so did the need for a permanent place of worship. So, in 1903, four men met at Cephas Spruill’s blacksmith shop at the corner of Chamblee-Dunwoody and Mt. Vernon Road and made plans for a new church. The four were: John Cates, who donated the land for the new chapel, Stephen, J.C. and Henry Spruill. This original wood frame chapel was built that year in 30 x 54 x 14 foot dimensions for a cost of $500. It was located across Mt. Vernon Road from where the current chapel, built in 1941 exist today. In 1935, Euil Spruill and a team of workers broke ground on what would become the site of the current brick chapel, on the north side of Mt. Vernon Road and behind Nandina Lane. The chapel is used today for children’s Sunday School classes. In the mid-1950’s, an addition was built in the back of the chapel and a cover added over the front door. The photo below shows the chapel with the addition. Year Built: 1829—first building. Four have been built on the site. Construction: First building was wood. Current building is brick. 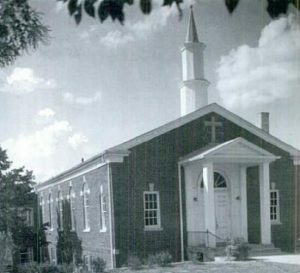 The first church established in Dunwoody was Ebenezer Primitive Baptist Church in 1829 which is located at the corner of Spalding Drive and Roberts Road. Before the congregation submitted a petition to become a Primitive Baptist Church, Sunday meetings were held in church member’s homes. Today, the church is still active and a sign on the grounds welcomes visitors to Sunday service at 7:00 PM. Some say the church was named after the founder of Dunwoody, Major Charles Dunwody, who is buried in the church’s cemetery along with other soldiers of the Confederacy. Over the years, four church buildings were built. The first one, made of wood, was diagonally across the road where the church currently stands today. The current church is built on the foundation of the third church. The story passed down through the church was that Confederate soldiers burned a bridge over the nearby Chattahoochee River to keep Union soldiers at bay. Union soldiers took boards from the first church to build a pontoon bridge. The first members of the church were from families with surnames including: Warnock, Ball, Jett, Martin, Holcombe, Abernathy, Roberts, Dalrymple and Adams. Citizens of Dunwoody and surrounding areas drive today on streets named after those families. Primitive Baptist churches do not allow musical instruments in church and instead rely solely on the human voice in what is known as Sacred Harp music. Sacred Harp singing uses four musical notes, called shape notes. The notes, fa, sol, la and mi are each represented by a shape. Singers sit in a hollow square with each of four sections represented by different voice ranges, tenor, alto, bass and …. The song leader or leaders stand in the center of the square. Located close to the DeKalb – Gwinnett County line is Eidson Cemetery on Winters Chapel Road. This well-kept historical cemetery is across the street from Winters Chapel Methodist Graveyard, another historical Dunwoody resting site. The Eidson family works hard to make sure the resting places of several of Dunwoody’s founders and their descendants are taken care of: Eidson, Donaldson, Gardner, Henderson, Lord, Martin, Spruill, Strickland, Woodall, and others. When Boyce Eidson conveyed this land, Dunwoody was quite the rural area. The most common profession for these families was Farming. Like many rural cemeteries from the olden days, we believe picnic tables and benches were built here for family gatherings held after Funerals. We find it easy to imagine them, and other families and friends enjoying meals together here, while reminiscing about their loved ones. There are at least three hundred seventeen burials, two hundred ninety-six of which are identified by flat markers, obelisks, and upright gravestones. Some are quite symbolic. Bois Eidson and his daughters Sarah and Jane for example, have a hand with a finger pointing upward indicating a pathway to Heaven on their upright gravestone. Bois’s son Jefferson Green Eidson, has a hand grasping a broken chain link with a finger pointing downward. This symbol often represents the Hand of God grasping a link of a chain to bring a soul unto himself. Jefferson’s Wife, Synthy Harriett (Hardman) Eidson’s marker has a dove which often represents love, purity, resurrection and the Holy Spirit. Boyce’s Great Grandson, Lon D. Eidson, Jr. died at twenty-three months. He has a child sized angel holding roses at his grave. We also have two unidentified above ground tombs near Bois and Catherine Eidson. Several generations of Eidson family members and other local families have served in the times of war. There are three known WW I soldiers, four known WW II soldiers and several others who served during the 1960s-1970s buried at Eidson. All cemeteries and graveyards have monuments and memorials which connect us with community and family history. Eidson has certainly helped us learn more about the history DeKalb County and more importantly, the progress of our Dunwoody. Size: 2,730 square feet. Two stories, four bedrooms, two bathrooms, two parlors. Isaac Roberts was the only engineer of the Roswell Railroad which ran from Chamblee to the Chattahoochee River in Sandy Springs area twice daily from 1881 until 1921. In 1894, Roberts built this home on a bluff overlooking the Chattahoochee River. The house sits on 2.8 acres of land and is just 300 feet from the river on a road now called Roberts Drive, named after the family. Isaac was married to Nancy and they had five children, all girls. The home features seven fire places, a kitchen, two parlors, four bedrooms, and two bathrooms. One of the parlors has an octagonal shape. Stained glass windows, gable details and archways are some architectural details in the home. Two modern glassed in rooms and a glassed in back porch were added by the current owners, Lloyd and Ruby Pittman who purchased the home in 1961. While the river flowed just behind the home, the Roberts never had a view from inside. The Pittmans added the rooms so they could enjoy the river views. Railroad track is still visible near the home, and Ruby Pittman said that there was gold in the springs near where the railroad ended, enough for Roberts to make five gold rings for his girls. In the back of the home, there is modern garage built to look like a barn and the driveway is shaped like a horseshoe. This summer home was literally a work in progress for several years after Dr. Geffcken, an Atlanta dentist bought 23 acres of land in 1931 for $3,000. The house was not completely built until 1941 and was rented for a few years to a couple until after World War II ended. The Geffcken family finally moved into the home in 1946. Like several Atlanta families, the Geffckens looked to purchase land in Dunwoody for a summer home and this acreage, which was quite elevated for the area, fit the bill. The views from their hilltop home were uninterrupted by other homes and trees as much of the surrounding area was farm land. Because of their spacious view, they could see both Kennesaw Mountain and Stone Mountain from their property and hence named the home Kenstone. Their daughter, Katherine, attended Agnes Scott College one year before the family moved into Kenstone, and became a boarder at Agnes Scott after the move. Later she attended Bryn Mawr and earned her graduate degree and eventually earned a Ph.D. For most of her career, she taught at Wellesley College. She currently lives in a condominium in Atlanta. Katherine recalls many stories of country life in Dunwoody. Her father loved it, her mother did not and was often lonely until she joined other housewives in Dunwoody and they formed a group that they called the Wednesday Afternoon Dunwoody Club. Once every two weeks, the group would meet at one of the member’s homes to socialize. Another memory that Katherine has is of hearing Sacred Harp singing from revivals at nearby Ebenezer Baptist Church. The house features a wood burning fireplace, original wood floors, beamed (trees) ceiling, a master bedroom with a gas fireplace and a gated driveway. The rear of the home features a turnaround driveway with Belgium ballast stones from Savannah, Ga and a large star compass. Year Built: 1840 – original structure. 1950 saw substantial addition. This house is the oldest home in Dunwoody and was initially built in 1840 by Larkin Martin on more than 300 acres. Just one year later, the house and land were sold on the steps of the DeKalb County courthouse on July 6, 1841 for $180 to John Ford after Martin fell on hard times. The house has changed hands at least 14 times since 1840 and is currently owned by Elena and Philip Green who purchased the home in 1986. Initially built with 2 bedrooms, living room and back porch, the porch was later enclosed to form a kitchen. Two more bedrooms, a bathroom, a kitchen and dining area were added in 1950. Another addition to the home in 1955 was a working ship’s port hole from the USN Atlantic which serves as a window next to the front door in the original structure. The house currently sits on approximately one acre of land. Much of the 300 acres of land purchased by Martin in 1840 was sold over the years to develop residential areas including the subdivisions of Sellars Farm and Mill Glen. Size: 3,484 square feet. 5 Bedrooms. 4 Full Baths. 1 Half Bath. Mills B. Lane was a prominent Atlanta businessman, President of the Citizens & Southern Bank, who built a summer home in the Dunwoody area (now Sandy Springs) in 1938. While his family lived in the house during the summer, Mr. Lane would join them on weekends. One of Lane’s biggest claims to fame was helping Atlanta’s Mayor, Ivan Allen Jr., bring the Milwaukee Braves to Atlanta. While the Braves were willing to make the move, they stalled on the decision until a stadium was built. Lane agreed to lend the city the money to build the Atlanta Fulton County stadium. The stadium was erected in one year’s time and the Milwaukee Braves moved to Atlanta in 1966. Atlanta was the first southern city to have a major league baseball club. The home is currently privately owned and sits on 1.2 acres of land. Morris Brandon was a prominent Atlanta attorney and politician who built a summer home on top of a hill overlooking the Chattahoochee River. Brandon was born in Dover, Tennessee in 1862, attended Yale University and married Harriett Inman on June 1, 1892. The couple had three sons, Morris, Jr., Walker and Nathan. Before building the summer home, Brandon was one of the initial homeowners in Tuxedo Park, a very upscale neighborhood in the Buckhead area of Atlanta. Neighbors included the Woodruff’s of Coca Cola fame. Brandon was a firm believer in education as a means of success, so as a tribute to that, his sons donated land in Buckhead for a school. The Morris Brandon elementary school is still operational on that site today. The school is quite popular and heavily advertised in real estate sales for that area. 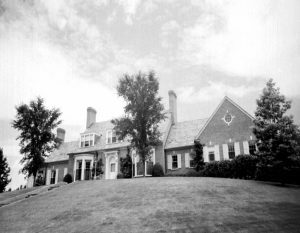 The summer home, which when built was considered the Dunwoody area, is on 27 acres of land which houses the only private school in the Atlanta area that accepts boarders, Brandon Hall School. The school was founded in 1959 with just a few students. As more students enrolled, more buildings were constructed on the site, but the main house remains, is used for administrative purposes and is called The Great Hall. This part of the home was renovated in the time period from 2000 – 2001. It’s not the actual size of the home on Sirron Court in Dunwoody that prompted the Norris family to refer to the house as “little”, but the comparative size to the original home which burned down in the late 1930s. 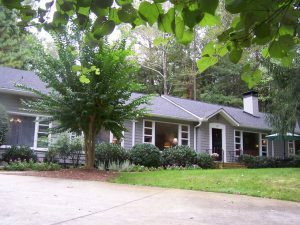 The current home, at nearly 2,500 square feet with an in-law suite, is comparable or larger than many current homes in Dunwoody. This smaller house, built on the property more than 100 years ago as a guest house, was occupied by the Norris’ eldest daughter, Marie Letts until the 1960s. The Norris family owned the Norris Candy Company in Atlanta and built their summer home in Dunwoody. Arthur Leland Norris was the founder of the candy company, which began in 1905 and was very successful. The business closed in the 1960s. Arthur and his wife had five children, three of whom lived to adulthood, two daughters including Marie, and one son Joel Davis Norris (J.D.). The family had many acres of land just south of Valley View Lane off of Chamblee-Dunwoody Road and Arthur had both the family home and guest house built on the property. The house is currently a private residence. An interesting fact about the house is that it’s located on Sirron Court. Sirron is Norris spelled backwards. Land that would one day transform into Dunwoody Country Club and several upscale neighborhoods started out as hundreds of heavily wooded acres purchased by G. Tom Bailey, an Atlanta businessman. Bailey, the proprietor of more than 80 black movie theaters across the US, purchased this acreage in the early 1930s. At that time, he and his wife either built or moved a log-chink cabin where they lived until they built their estate. Mrs. Bailey loved the Williamsburg style and hired an architectural firm (Frazier and Bodin) to build their home. The house was built on concrete and is made of concrete and steel. The story is that these materials were used partly because of Mrs. Bailey’s fear of fire. At the time the home was built, the nearest fire station was in Buckhead. Several walls in the home are three feet thick and consist of concrete and steel. The home was built in 1939 and the Bailey’s lived there until 1967 when they put the house and 257 acres of land up for sale. 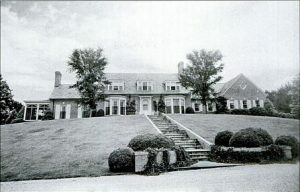 The Dunwoody Country Club purchased the property and began building the golf course and club on some of the land. As the remainder of the land was developed, the Bailey Estates subdivision was built around the original home which still stands today. It is also thought that the Deerfield and Hunter’s Woods subdivisions were built on land originally owned by the Baileys. Other buildings that used to exist on the Bailey estate include: barn, stable, greenhouse, cannery, tennis courts, fountains and a section of lawn with flagstaff paving where the Bailey’s hosted large dinner parties. There was also a house they named “Marie Antoinette House” that the Baileys built for visitors. On a trip to France, the Bailey’s saw such a house and hired a builder to make an exact replica, but at one third the size of the original. Another house that existed on the property for visitors was called the Spring House because it was built over a spring which was visible from inside the house. During drier months, the spring would no longer flow, so the family built a pond with a dam and power pump which could be cranked up to run the water through the spring. The house was restored after the Baileys owned it by Stephen and Kerry Fuller, architects. Two more master bedrooms were added to a renovated attic space along with a playroom. The basement was renovated into an entertainment area with a bar. The Roswell Railroad used to run between Roswell and Chamblee with a stop in Dunwoody along what is now Chamblee-Dunwoody Road. The train was referred to as The Dinkey or Old Buck and it made two daily trips to from Roswell to Chamblee. The train carried lumber, cotton, woolen goods and product to Chamblee. Supplies, manufactured goods and catalog orders were carried back to Roswell. Along with five or six flat or freight cars, there was also a baggage and passenger car. There were four scheduled stops along the route including Dunwoody, but the train would stop along the way to pick up and drop off passengers at unscheduled stops if requested. Three of these section houses were built to house railroad work crews in charge of maintaining the train’s roadbed. Two were demolished for commercial development and this one remains right across from Dunwoody Village. This section house has accommodated several commercial businesses in recent years including a flower shop and a telecommunications store. Major Charles Dunwody built the track in 1880. Dunwoody was originally from the Roswell area and Dunwoody is named for him. Sharon Methodist Church was formally established in 1889. The land on which the church now sits, according to the limited documents available, was deeded by A.J. Copeland and George Wing to the church’s three Trustees in 1897. The three Trustees were Hiram B. Childs, J.A. Park and G.J. Copeland. The women of the community solicited monetary donations; the men furnished the lumber and built a small church with volunteer labor. This church was called “The Mission” because anyone was welcome to preach and worship regardless of their beliefs or membership. The Mission joined the Methodist Conference in 1899. Rev. John G. Logan was appointed the first preacher in December of 1899, followed by Rev. R.C. Gleckler in 1900. Rev. Loy Wormick served from 1902-1904. During a five-week revival in 1903, Rev. Wormick added forty-nine new members to the church roll. In 1904 the members of The Mission voted to build a new church and the land was deeded to the North Georgia Conference of the United Methodist Church. The church was renamed “Sharon,” and a new church building was built. Charter members of the church recorded in 1900 included family names such as Copeland, Carpenter, Childs, Norton, Wallace and DeLong. Members of the Spruell (note spelling) family were recorded shortly after. Stephen Spruill was a Dunwoody pioneer who owned hundreds of acres of land in the area. When he married Mollie Lee Carter in 1889, he moved into a log home behind his grandparent’s home near the current intersection of Ashford-Dunwoody Road and I-285. Mollie and Stephen had 11 children. In 1905, he moved his family into this home, his grandparent’s home which was originally built in 1867. He modified the home into this Victorian farmhouse by covering original logs with wide boards. The house features a stone fireplace, oak floors and an ornately carved mantelpiece. The building currently serves as the Spruill Center for the Arts and houses an art gallery, historic exhibit and gift shop. 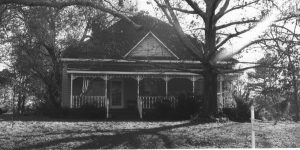 Spruill’s heirs donated the home, two outbuildings and 5.4 acres on Ashford-Dunwoody Road to the North Arts Center in 1991. The Arts Center agreed to move the home to the current location and to use it for educational art purposes. A story passed down by the Spruill family contends that family valuables were hidden under the smokehouse in a cellar during the Civil War. Size: Originally built with three rooms, the home was added onto. Willis J and Clara Swancy purchased this home which originally sat on 31 acres of land in 1930. 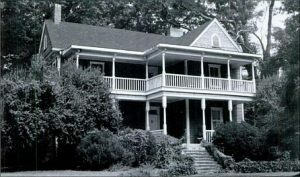 Clara’s family lived in a home on land across the street from Willis and Clara – – land that currently is the site of the DeKalb County firehouse on Chamblee-Dunwoody Road. Wills and Clara’s family included two children who all lived in this three room house. They also had a barn on the land. Willis later added a kitchen and porch onto the house, tore down the original barn and built another. In the 1940s, stairs were added and an upstairs room was built. The home did not have electricity until 1945 because a nearby farmer did not want power poles on his property. The farmer thought the power poles would lower his property value. Indoor plumbing was added in 1950. The family raised chickens and had some cows on their land. Later, in 1966, Willis and Clara sole 21 acres of their property and built a new brick house behind their original farmhouse. The Knollwood subdivision was developed on the 21 acres. More acres were sold by the Willis’ in the 1980s and the home currently sites on one acre. Swancy family members lived in the original farmhouse until 1996 when it was sold to its current owner who added more rooms and remodeled the home. This home was built on 10 acres of land purchased by Dr. T.K. Peters in 1945. Peters was involved in very interesting historical events including the San Francisco earthquake of 1906. He was staying in a hotel when the earthquake struck and he began to film what he saw. Ironically, Peters had shot 55,000 feet of film on a tour of China and was in negotiations with a California studio to sell the film when the earthquake hit. His film of China was lost in a fire during the quake. Peters worked on movies making sets including the very famous “parting of the Red Sea” scene in the first filmed version of The Ten Commandments. In 1935, Peters was asked to join a project at Oglethorpe University in Atlanta to archive the history of the world, 6,000 years, at the time. Peters joined Dr. Thornwell Jacobs in creating the Crypt of Civilization and worked on the project filming books and other reading material for three years. Finally, in 1940, the crypt was closed and was to remain so for 6,000 years. Peters and his wife Grace lived on the land until 1961 when they sold the home and six of the acres and moved to California. The home was made of cinder-block and brick and was built on the site of an early Battle of Atlanta related conflict on Wild Cat Creek. A mill originally stood on the property and Peters mounted a millstone which was six feet in diameter on the front of the home. In 1975, DeKalb County purchased the home and property to serve as an arts center. After several years, the arts center required more space, so it was moved to the North DeKalb Cultural Arts Center. For the three years following the move, vandals destroyed property on the site and the community stopped using walking trails due to safety concerns. In 1990, a community group got together to create the Dunwoody Nature Center on the site where it thrives today. The center holds art classes and summer camps. 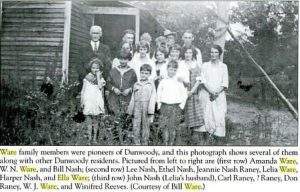 The Eidson family members were pioneers in Dunwoody. Boyce and Zachariah were brothers, the first in the family to move to Dunwoody. Both brothers donated land for various landmarks including the original Dunwoody Elementary School (donated by Zachariah) and the Eidson Cemetery on Winter’s Chapel Road (donated by Boyce). Boyce’s son, Douglas married Margaret Warnock. They had several children including Lon (Lonnie) who built this brick home on Chamblee-Dunwoody Road. Lon owned a store and filling station nearby, also on Chamblee-Dunwoody Road. Lon and his wife Bertha had two children, Perry and Bertha. Some of the memories shared by the children of moving into this home include building a fire around the wash pot for their first bath in their new home. The house included two fireplaces which helped provide heat for the house and a set of French doors which separated the living and dining rooms and helped retain heat in the primary living areas of the home. Bertha was the first president of an organization called the Dunwoody Home Demonstration Club which began in the early 1920s from a program at the University of Georgia intended to instruct farmer’s wives on optimal methods to preserve and prepare foods. The wives gathered at these home demonstration clubs and learned about canning, pressure cooking and freezing foods. They met initially at the Eidson home and then in the cafeteria / library of Dunwoody Elementary School. Lon and Bertha’s son, Perry married June Dempsey in 1947. The two met at Dunwoody Methodist Church where both families were members. 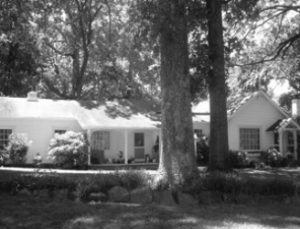 Perry and June lived near his parents on Chamblee-Dunwoody Road and today, June lives in the original brick home built by Perry’s father, Lon. Eidson Hall, a neighboring subdivision, began development in 1999 after the family sold a portion of their land for the subdivision. This home is currently located in the parking lot of the Life Center Family Church. It currently serves as business offices for the church. The house originally faced Mt. Vernon Road, but was moved by the church to the parking lot. The house was built in 1876 by John Ware, a farmer from Newton County, Georgia. The Ware family can be traced back to the United Kingdom and descendants from England and Ireland. The first Ware family descendant arrived in America in the 1600s and settled in Virginia. John Ware’s home was built on 170 acres of farm land which extended to the Chattahoochee River and included land where the Orchard Park Shopping Center stands today. His son, William N. Ware, Sr. was born in the house in 1877. William (Newton) Ware, married Ella Warnock, another Dunwoody native whose family also owned a house on Mt. 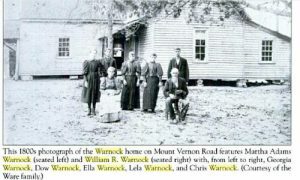 Vernon Road that is still standing today (The Warnock Cottage). They had a son, William Ware, Jr. who grew up in the house and attended school in Dunwoody. The Ware family was greatly affected by the depression and had to leave the farm despite William’s best efforts to retain it. At one point, William operated a still in the area where the Brooke Farm subdivision stands today, but that was not enough to save their land. They sold the land to the Spruill family and the family moved to the Kirkwood area of Atlanta. Size: 3,438 square feet. Three bedrooms, five bathrooms. Originally facing Mt. Vernon Road, the house is located in the Dunwoody Club Forest Neighborhood on Houghton Court. Commonly referred to as “The Shack”, the home featured high ceilings, spacious rooms and an interesting style of architecture. The house was built for Mr. William C. Wardlaw and his wife Gertrude as a summer home in 1936. The family also had a home on Juniper Street in Atlanta where William was Vice President with the Trust Company of Georgia. The Wardlaws had two sons, William, Jr. and Platt. Platt died of pneumonia at the age of 14 on January 1, 1924. 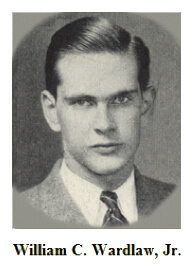 William, Jr. was an honor student at the Georgia Institute of Technology, graduated in the late 1920’s with a degree in textile engineering, and was an active member in the “Tech” community for more than fifty years. He founded Wardlaw & Company, an investment advisory firm in Atlanta and was President until his death in December, 1983. The Wardlaw Center, a multipurpose facility serving Georgia Tech’s administration, governing boards and athletic program at Georgia Tech, is named for him. There was a wooden adirondack style gazebo in the back with about nine arrowheads that formed the initials BW – B Wardlaw. The arrow heads came from the property. B. Wardlaw used the letter B for his first name and is the author of a book titled Coca-Cola Anarchist. A 200 years + oak tree fell on the gazebo in 2003 or 2004 and destroyed it. The Warnock Cottage on Mt. Vernon Road was built in 1913 and is the site of the original house constructed in the late 1800’s by William R. Warnock. William’s family emigrated from Ireland and initially settled in Dunwoody near what is now Ashford-Dunwoody Road. The Warnock family was traveling through dense forests and thickly wooded trails in their covered wagon when they made camp for the night. As the sun rose the following morning, William’s father declared that he was tired of traveling and decided to stay right where they had camped, and built a log cabin on the site. Later, William married Martha Amanda Adams whose family were members of Ebenezer Primitive Baptist Church. Near the time of their marriage, William purchased land and built their home on Mt. Vernon. William fought in the Civil War and was injured at Gettysburg when he suffered a gunshot wound through his left ankle. William died in 1908 and he and Martha were buried at the New Hope Cemetery on Chamblee-Dunwoody Road. Their son John married Ada Baker and they had four children. One child, Florence, married Carey Spruill. Florence and Carey’s family were the last residents of the Cheek-Spruill farmhouse at Mt. Vernon and Chamblee-Dunwoody Road. Warnock, Ware, Woodall, Swancy, Donaldson and Spruill are just some of the surnames of Dunwoody pioneers buried in this cemetery. The cemetery is adjacent to the same named church which was built in October, 1871 and was named for Jeremiah Winters, an early founder of the church. Before the church building was constructed, services were held in private homes. There are more than 400 grave sites in the cemetery. Some of the church’s founding members are buried here including: Susan Cobb, John and Eliza Ware and Ida Womack.